Nick Brandt has been documenting the vanishing African landscape since 2001, creating some of the most haunting images of a disappearing world since Edward S. Curtis traversed the Great Plains one hundred years ago. His epic photographs have been presented in a series of books that underscore Brandt’s devotion to his work. 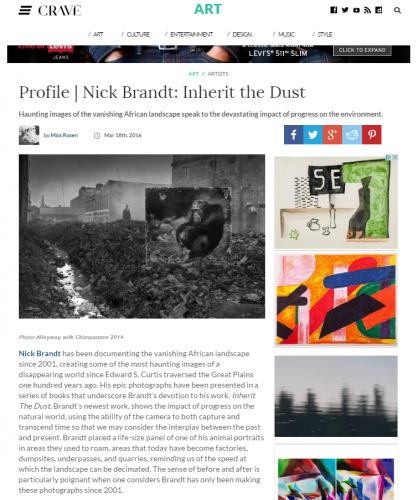 Inherit The Dust, Brandt’s newest work, shows the impact of progress on the natural world, using the ability of the camera to both capture and transcend time so that we may consider the interplay between the past and present. Brandt placed a life-size panel of one of his animal portraits in areas they used to roam, areas that today have become factories, dumpsites, underpasses, and quarries, reminding us of the speed at which the landscape can be decimated. The sense of before and after is particularly poignant when one considers Brandt has only been making these photographs since 2001.